Basically, I want to know if I need this whole kit, or if I can just replace the bearing and maybe sleeve? Please run me thru a breakdown of what I would require. BTW, I intend to get a local shop to do the work, but I need to know what parts to buy. 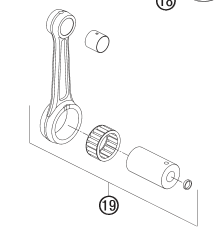 but the decision on what to replace should be made by the person rebuilding the crank after it has been disassembled. Thanks. Again, it seems weird to me that the rod itself has to be replaced... why is this? doesn't the bearing take the load (and wear), but the rod itself stays relatively untouched? What would determine if the rod is knackered? Out-of-round on the journal faces? Doing a "refresh/rebuild" just got 50% more expensive knowing that the entire "kit" must be purchased. after a while say 150 to 200 hard hrs the silver coating wears off and then the cage starts to wear out the inside of the rod. with an uneven surface to press on, the rollers experience higher loads and palling starts. Edit: this won't work... for 525 EXC (wasn't thinking about stroke length). Anything similar? Last edited by jmscrttndn; March 25th, 2015 at 08:50 AM. the bearing and pin are similar, rod is not. I did a rebuild twice on my 450, first when I got it after the previous owner and the WEC had it ,was just plain wore out. The second time was my fault, and that time I had to replace my Con Rod, the first price I got was $805. cdn, I think I ended up get one for around $650. not a cheap part. I think I could have got one from Taffy all in with shipping for a lot less, but I had already purchased one. Pressing it all together is a bit tricky, good to use some one who does them. I am in the process of buying up parts for a complete re build kit for my 450, just to have. Really love the bike it's to bad it went to the wayside. Last edited by fedge; March 26th, 2015 at 11:11 AM.
. the rod you quote fella is 9mm too long. just go into my web shop and look for 100806 OK? 100783 if you want a little end bush as well. the guy above has said how he should have kept it simple.